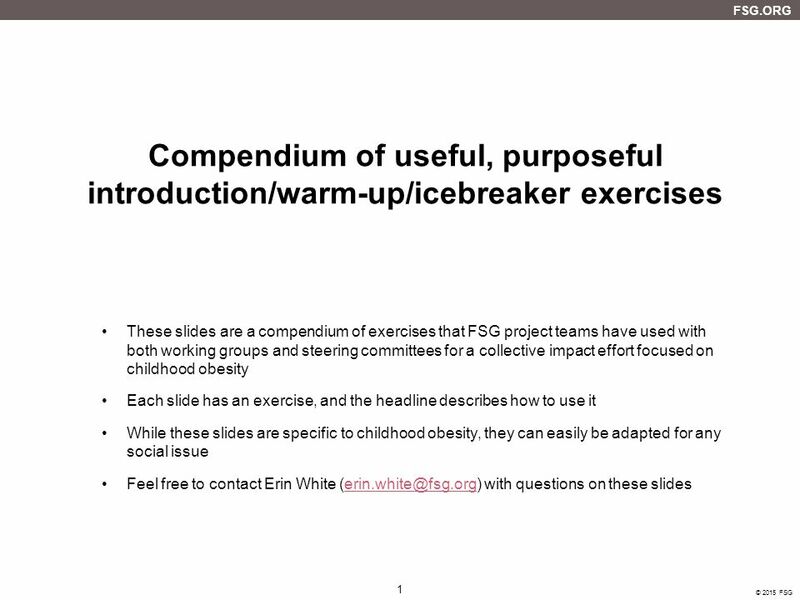 Compendium of useful, purposeful introduction/warm-up/icebreaker exercises These slides are a compendium of exercises that FSG project teams have used. 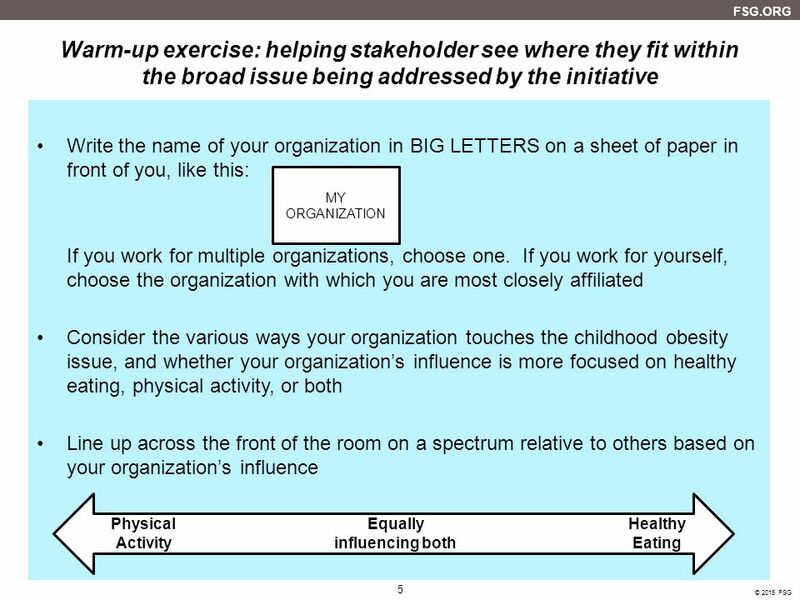 Name, Title, Organization What does your organization do? (Explain as if to someone you just met sitting next to you on a plane). 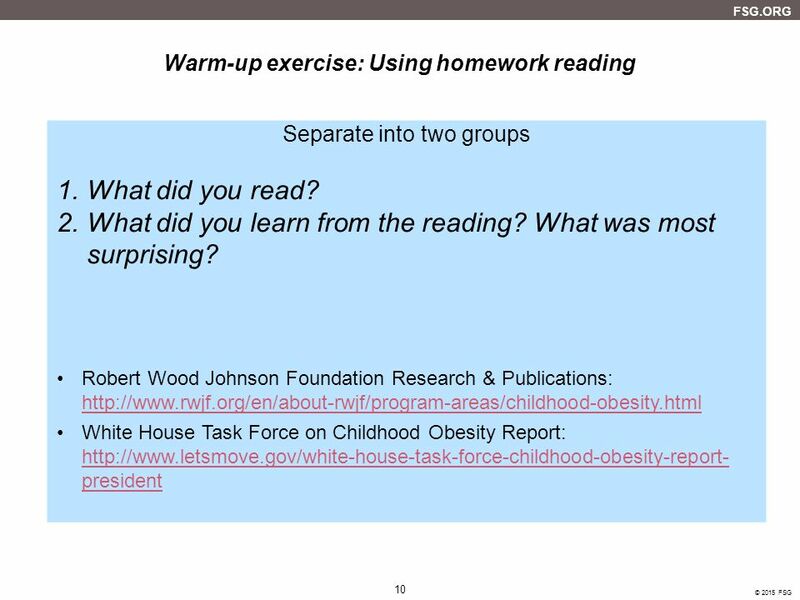 How does your work touch childhood obesity? Find a partner you don’t know well. Ask, What do you do? Why is it important to you? Hmmm, why is that important to you? Keep asking, “Why is that important to you? why…” until you make a discovery about the fundamental purpose behind why your partner’s work is important. 7 Find a partner you do not know well. 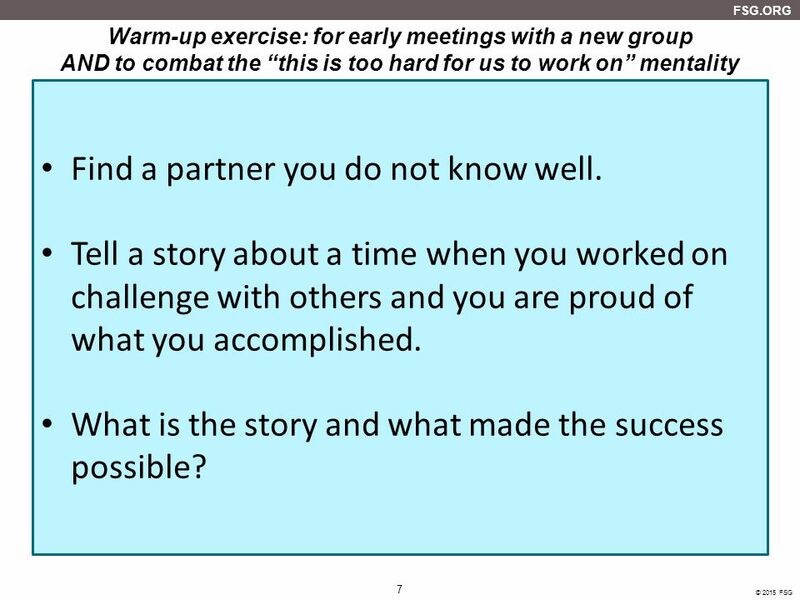 Warm-up exercise: for early meetings with a new group AND to combat the “this is too hard for us to work on” mentality Find a partner you do not know well. Tell a story about a time when you worked on challenge with others and you are proud of what you accomplished. What is the story and what made the success possible? 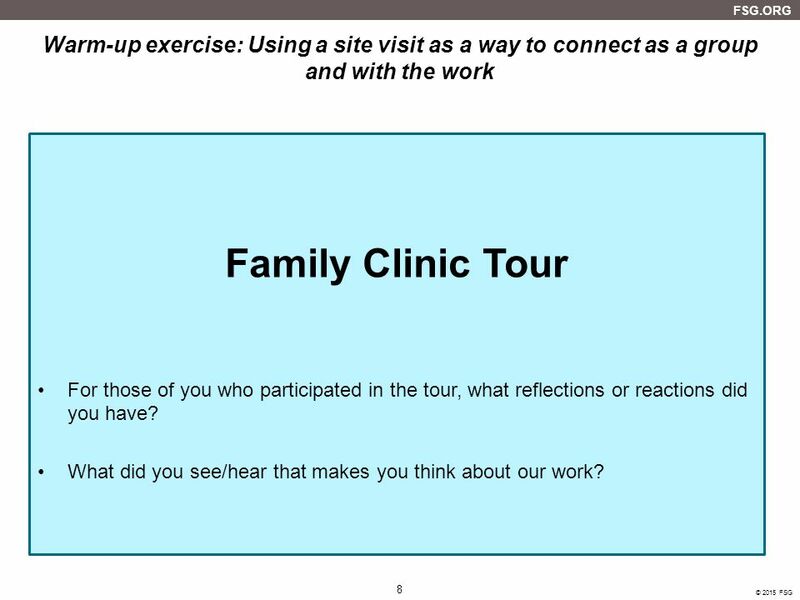 Family Clinic Tour For those of you who participated in the tour, what reflections or reactions did you have? What did you see/hear that makes you think about our work? 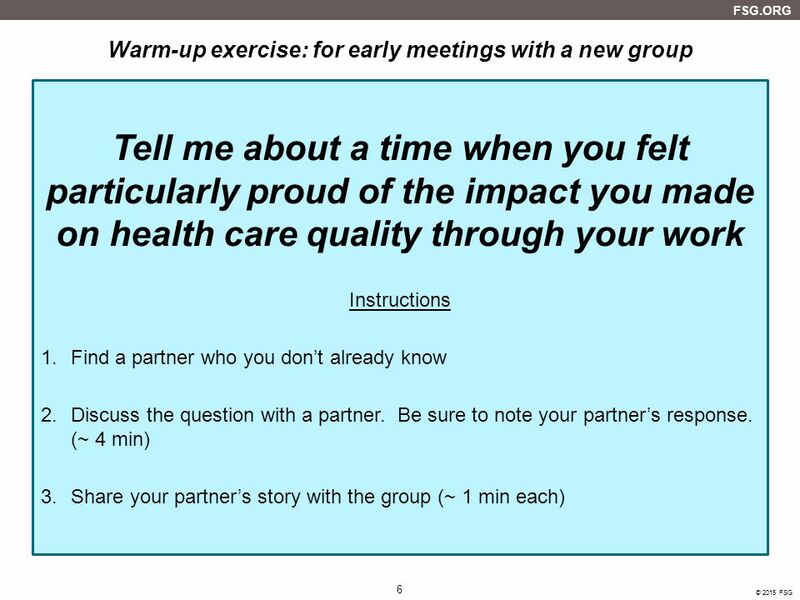 OR if the group has already been meeting for awhile Think of a time in the development of the collective impact initiative that you remember feeling excited, inspired, and very proud of what was happening. What was the situation? Who was there? What was your role? What was the core factor that made this experience possible and so meaningful? Tell your partner a story about this experience. 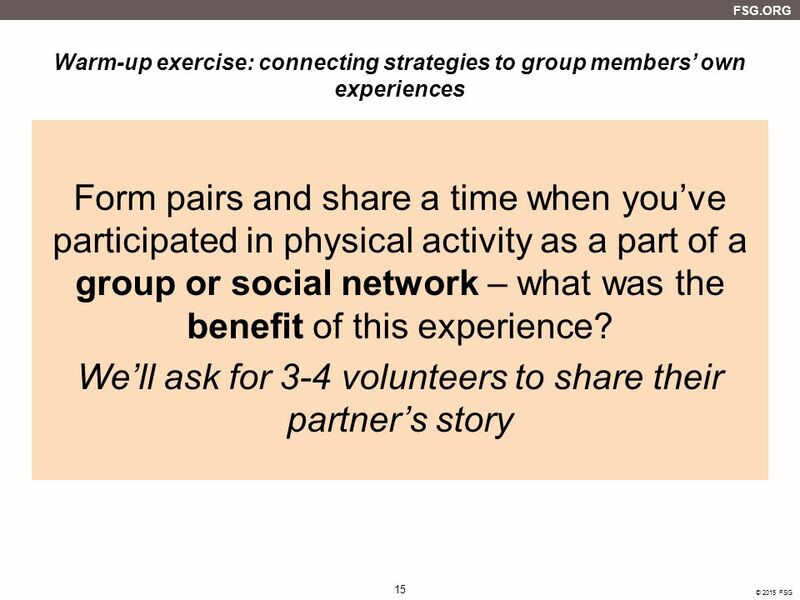 Report out to the group on what you heard and how we might use that experience guide our future work together. 11 What connections emerged during or after our last meeting? 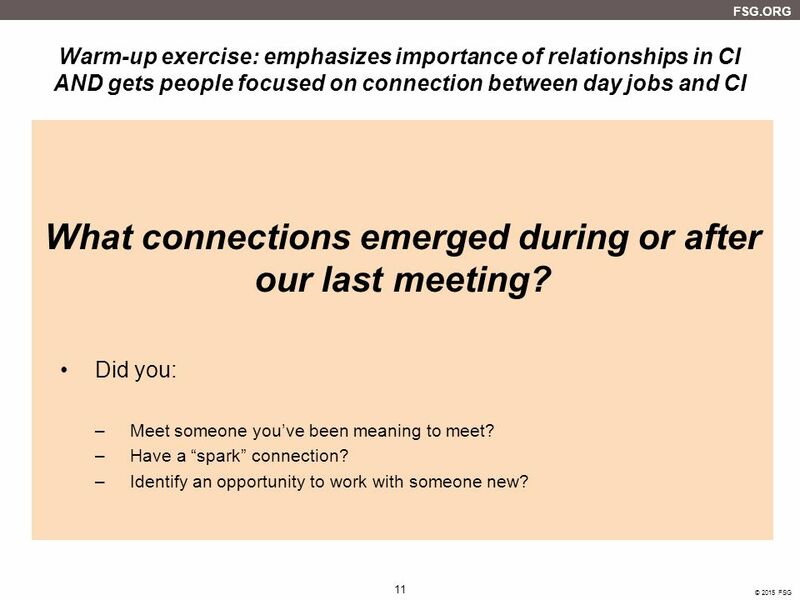 Warm-up exercise: emphasizes importance of relationships in CI AND gets people focused on connection between day jobs and CI What connections emerged during or after our last meeting? Did you: Meet someone you’ve been meaning to meet? Have a “spark” connection? 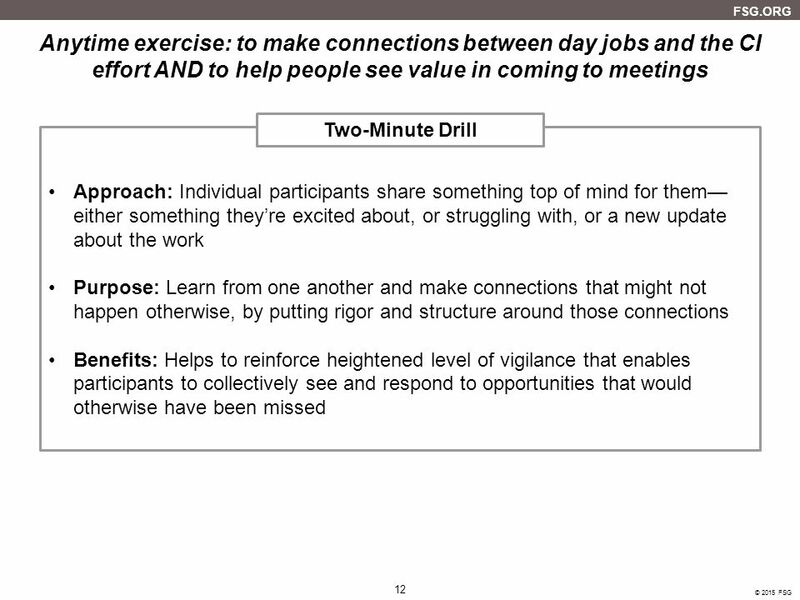 Identify an opportunity to work with someone new? 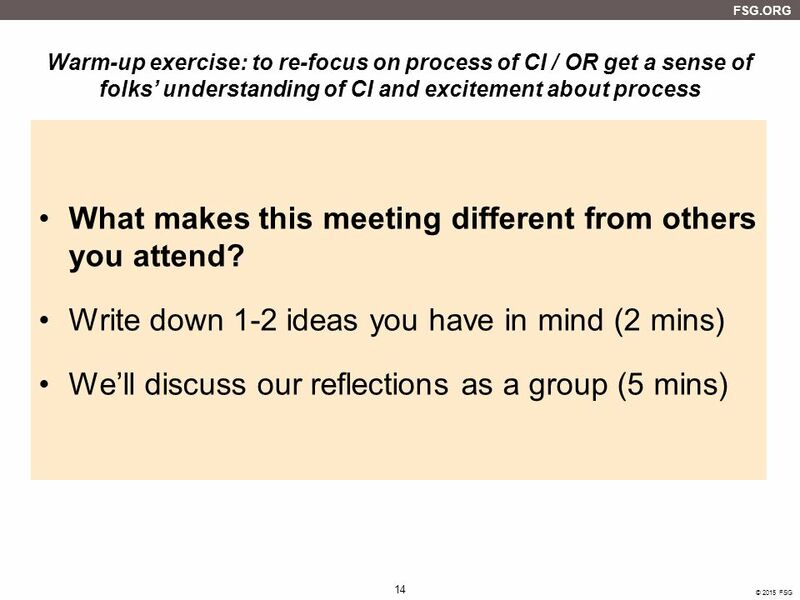 14 What makes this meeting different from others you attend? 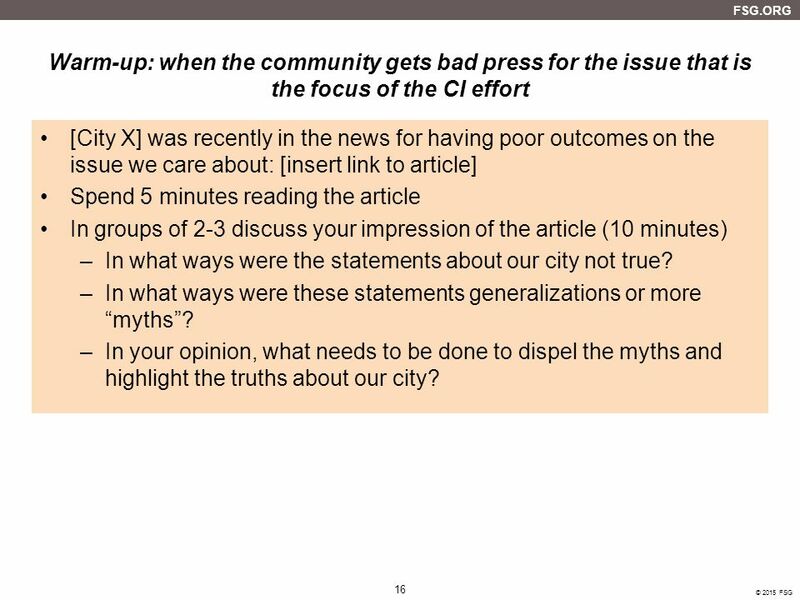 [City X] was recently in the news for having poor outcomes on the issue we care about: [insert link to article] Spend 5 minutes reading the article In groups of 2-3 discuss your impression of the article (10 minutes) In what ways were the statements about our city not true? In what ways were these statements generalizations or more “myths”? In your opinion, what needs to be done to dispel the myths and highlight the truths about our city? 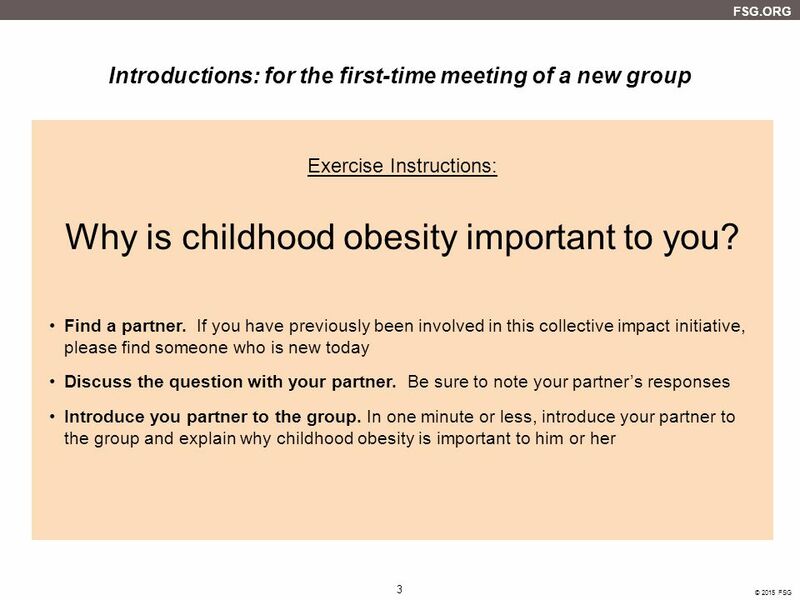 Download ppt "Compendium of useful, purposeful introduction/warm-up/icebreaker exercises These slides are a compendium of exercises that FSG project teams have used." 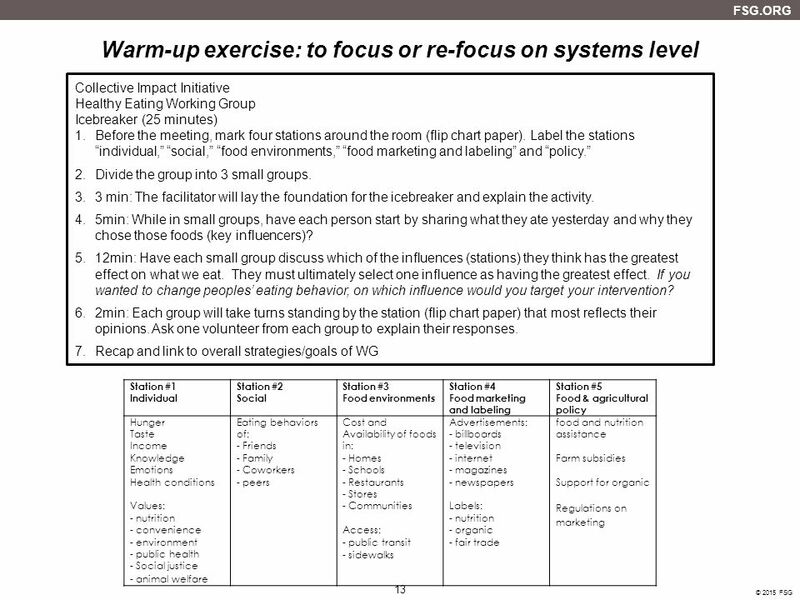 Coaching Data Teams DEVELOPED BY JANE COOK LITERACY & TECHNOLOGY COACH, EASTCONN & BETH MCCAFFERY SCHOOL IMPROVEMENT. 1 CHI CLINICAL GOVERNANCE REVIEWS Half-Day Event for PCTs Paul Bates, Chief Executive, Herefordshire PCT 5 November 2002. 1 Listening and Asking Clarifying Questions ©2008, University of Vermont and PACER Center Listening and Asking Clarifying Questions PCL Module 6. 0 Solving Problems in Groups ©2008, University of Vermont and PACER Center Solving Problems in Groups PCL Module 9. Shaping a national template on Community Health Worker training for asthma home visits.